Through masala-appropriate coincidence, I happened to watch what is maybe one of the last great gasps of 1970s style masala, Jagir, right on the heels of an unspeakably awful film from late in the career of Satyajit Ray. 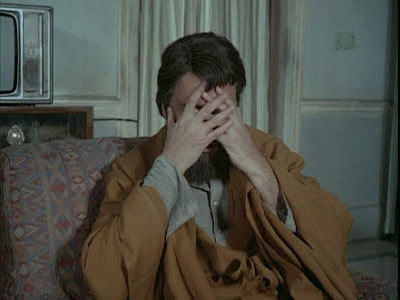 Shashi ki kasam—Soumitra ki kasam, even—I did not intend to couple a boring, depressing, shouty, badly acted, and irritating arty film with cracktastic Decline and Fall Masala, but that's how the DVDs fell. Out of fairness to Ray, I want to be clear that I hated Shakha Proshakha almost from the instant I started watching it, and it being assigned the label "avoid yaar" has nothing to do with the wonders that followed it. This was my reaction to the film throughout. What's wrong with Shakha Proshakha? EVERYTHING. If Soumitra Chatterjee is unwatchable, you know a film is in deep, deep trouble. This is the only time in my admittedly brief but intense affair with his work that I've seen Soumitra even come close to overdoing anything (oh okay, maybe he indulges a bit in Jhinder Bandi, but he was young and wearing hilarious historical turbans, so we must forgive him)—one of the things I admire about him as an actor is how finely he expresses life-shattering drama and disappointment—but, at least in this film, when he came up to that stylistic cliff, he leapt off with abandon. Yikes. 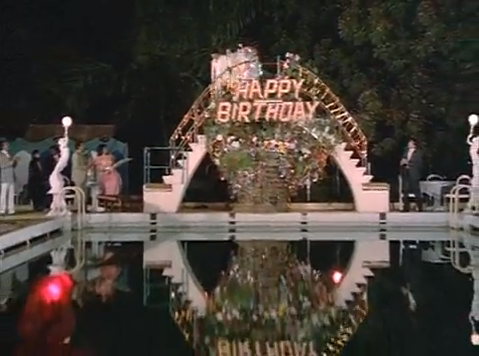 The first ten minutes of this, in which he and Ajit Bannerjee (playing his father) yammer on about the past and dashed hopes and settling in life, remind me of the Star Wars Holiday Special from 1978 in which the first ten minutes are entirely in Wookie. MAKE IT STOP. This film feels like a fake art film made to look like what a pretentious college filmmaking student would think is profound, like miserable people being either self-sacrificing or selfishly smug, peppered with touches I have learned to recognize from Ray's other works, like socially awkward picnics and men pontificating in paisley bathrobes. It might be telling that SatyajitRay.org does not even have a review of the film, let alone any quotes from reviews from other sources, which I think it has included in its entries for every other of the 18 Ray films I've seen so far. I have no idea how this film was received at the time of its release, but it's heartbreaking that this is Ray's last work with Chatterjee. At least it ends on a genuinely emotional and touching moment (which I won't show you because of spoilers), and those of us in the future can look back at that great collaboration ending with proof of their skill. Now, just for fun and palate cleansing, Amrish Puri will demonstrate my delight with Jagir, which would have been vast anyway but on the heels of Shakha Proshakha was downright giddy. ALL YOUR MASALA ARE BELONG TO ME! There is no reason for me to tell you much about the story because any of us could have sketched it in our sleep, and fortunately the great Sachin Bhowmick was at his finest and created an almost perfect recipe of coincidences, long-lost family members, traumatized children, gypsies, treasures, anipals, and general adventuring silliness. The film is criminally weak on female characters—the heroines, for lack of another term, do little, the romances are blah, and there are no lecturing or dramatically sacrificing maas—but even I don't really care. So in love with the rest of the film am I that I will simply acknowledge the filmmakers had no use for women, scowl once very fiercely, and set that criticism aside. The rest of the film is awesome. Every element is in top form, in both concept and execution, and I found myself saying "Oooh, of course!" as plot points lined up or the past echoed into current actions and noticing my jaw agape at satisfying details and decisions many, many times. Take a look. The cast. MY STARS, the cast. 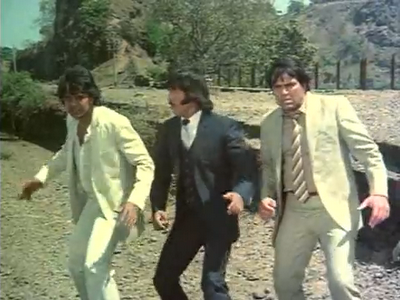 Dharmendra, Mithun, and Danny as brothers in arms (and of course two of them are actual brothers). 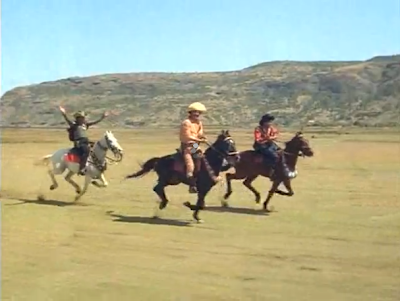 Sometimes they play cowboys and Indians. 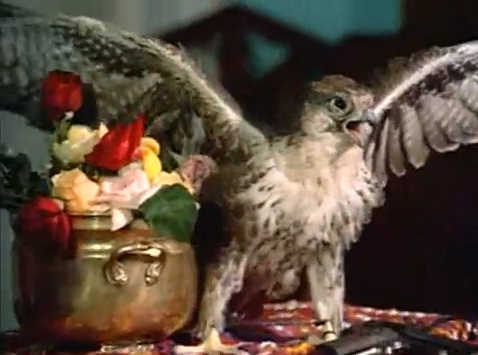 Pran with an anipal, a very, very helpful falcon named Shamsher. Iftekhar, Amrish, Ranjeet, Mac Mohan, Sujit Kumar, and Bob Christo as their respective you-know-whats. The Pool gets a party makeover and a sort of disco slow dance song. Keep an eye out for the pink boas. An underground masala death trap has menacing spikey pyramids that move around the floor and shackles that fling themselves onto their targets! There's a secret temple full of treasure hidden inside a cave. Shiva wears this. Not to be outdone jewel-wise, both Dharmendra and Amrish try to steal this crown, even though it complements Zeenat's outfit way better than theirs. 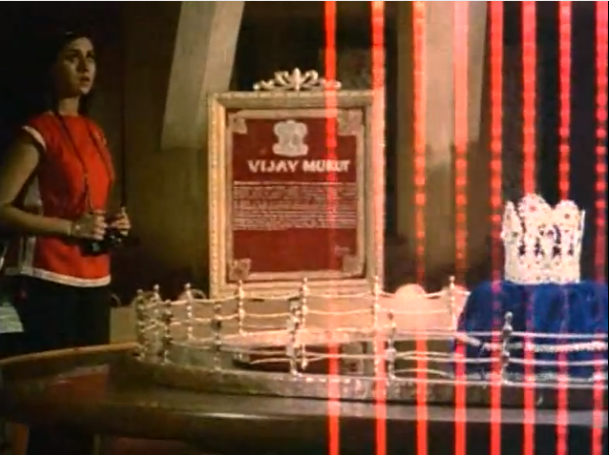 The crown is put on display in a museum which is described as having stupendous security. This is funny for several reasons, one of them being that most of the Indian museums I have visited would be incredibly easy to rob, but more importantly this particular institution (which is filmed in a room I recognize from Dharmatma)'s security consists of some red lights and a little string fence that would not hold the plastic Barbie horse I had in 1983. 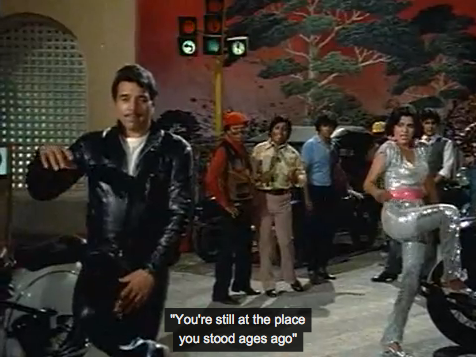 The film is as amused as I am that Dharmendra is doing this kind of role at age 49. "You're still at the place you stood ages ago," sings Zeenat. "New things are a passing fancy," he retorts. You can't quite tell from a distance, but get up close and it's clear he's begun to age. It's at least half a decade too late to put Dharmendra in head to toe black leather, in my opinion. But A for effort. He must have royally pissed off someone in the wardrobe department who takes revenge by dressing him like a a very dorky dad in most of the film. 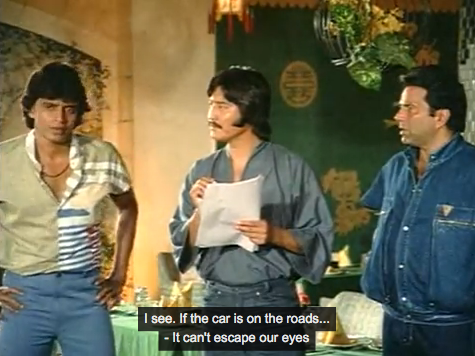 These pictures show the standard wardrobe for the film: Dharmendra is dad in trousers one waist size too small, Mithun is ready to pick up chicks at the mall (or the disco, in the scenes with white pants and Beatle boots), and Danny has blousy tops and pants so tight it's a good thing he already has a kid. 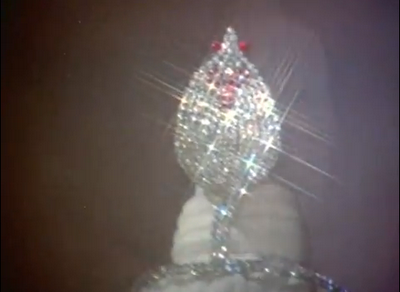 Then again, maybe the wardrobe department is angry at everyone in this film. 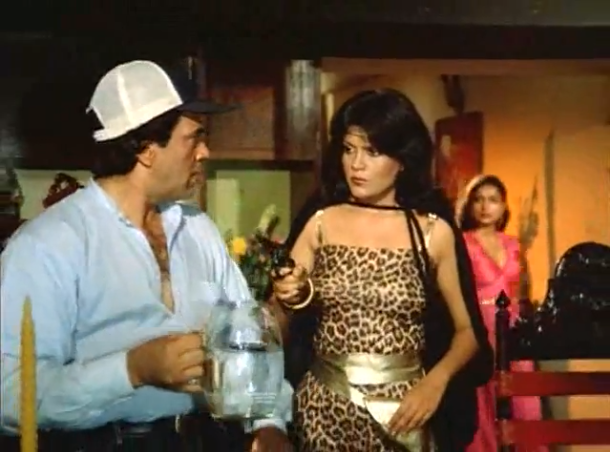 This is what Zeenat wears in her own house: skin-tight leopard-print bustier jumpsuit, black cape, gold headband, and gold holster belt. With a pistol in it. As one does. 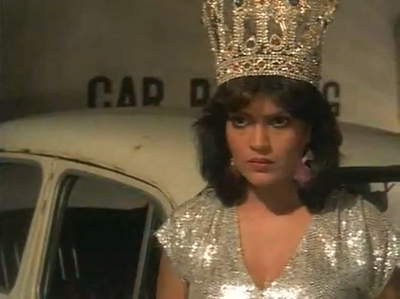 Shoma Anand, as Mithun's love interest/Amrish Puri's daughter, has an even worse time of it. 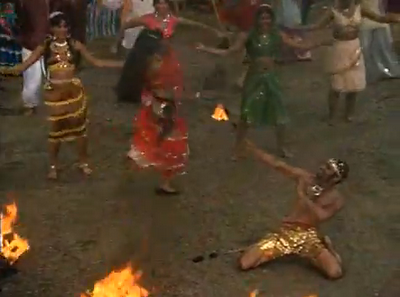 They even made a backing dancer/fire-eater wear a gold loincloth. 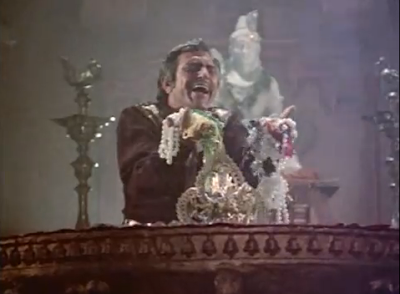 A lot of the dialogue in Jagir is funny or zippy, mostly in the one-liners hurled back and forth between chief baddie Amrish Puri and whomever he's tormenting at the moment. "Shame on your manliness! Why are you using a whip?" • Mithun: "Are you scared of the man with the steel teeth?" 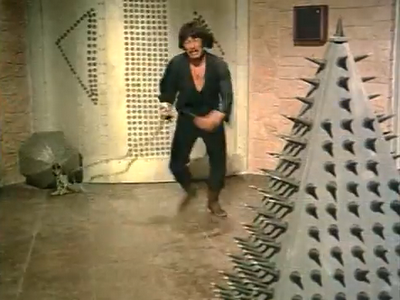 (Did I forget to mention there's a 7-foot-tall henchman with steel teeth? There is! Click here for a picture.) Shoma: "Allah! I'm so beautiful even men with golden teeth are after me." • Pran with his bird, who has just dropped a gun onto an end table: "Shamsher? Where did you find the gun?" Shamsher: [Squawk squawk!] 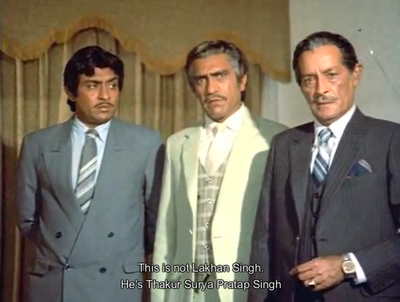 Pran: "I see. The robber tried to kill you? I won't spare him." • Multiple leads in the song "Shaher Calcutta" (no idea why they're in Calcutta), echoing the portrayal of the city seen this year in Kahaani: "Calcutta, the city of mazes, I've lost my way!" "In my own country, I feel like an alien here." 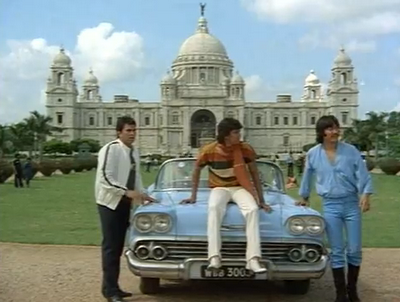 It also works as a low-budget tourism video, tossing in mentions of things like the Howrah Bridge and Tagore. It's all extremely irrelevant and I wonder if the song was added in exchange for filming permits from West Bengal. If all that is not enough to tempt you to see this, there are a few more of its many amazing details in the tweets I posted while watching. Read them here. Just don't ruin your appetite for this feast of a film. It's at least a week's worth of R(ecommended) M(asala) A(llowance) of all the good stuff. This has nothing to do with anything, but how could I omit it? Beth, another great review. The 7-foot tall villain with steel teeth is undoubtedly an homage to the character Jaws (played by Richard Kiel), from the post-Sean Connery James Bond films; see his Wikipedia entry. haha i remember both movies vividly. i think i saw both when i was about six, and guess which one i liked better? shakha proshakha was as dreary as watching a state sponsored documentary about lyme disease. i do remember hearing the tidbit, that soumitra was attempting to go method a la dustin hoffman in rain man, from the adults at the time. i don't know if that was meant in jest or not. he did have some annoying actorly tics in that movie though. 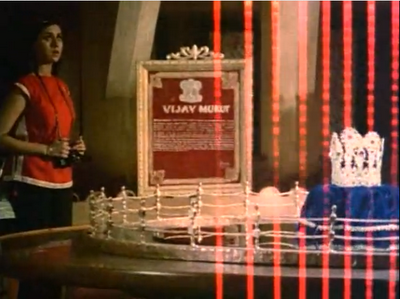 jagir was actually dubbed as "teen murti" (i think?) for the bengali market! hence the calcutta scenes. it was designed as a bilingual film, but it probably didn't make much money in Bengal, hence no wikipedia records seem to exist. Sapera - I'm so glad you commented! I have yet to hear from anyone who likes Shakha Proshakha. I wonder what in the world Ray was thinking? I love your description - it really is that boring. The story about Rain Man would make sense, but my god, did he ever botch it. Granted he had nothing to work with, but ugh, SO overblown. I've been reading quite a few interviews with Soumitra lately and will have to go back through them to see if he says anything at all about this film. And what wonderful trivia about Jagir! A bilingual release would really explain the little Calcutta interlude, which is un-integrated into the film and could be set in any city.